Wine can have a savory taste, I've experienced it countless times. It is not specific to a grape variety, I find, more to certain places and techniques of wine making. For example, Jura wines, some red and almost every white have a certain umami taste to me. And most Sherries aged under flor. Many Champagnes too. Where does this umami taste in wine come from? One of (Akira) Kuninaka's most important discoveries was the synergistic effect between ribonucleotides and glutamate. When foods rich in glutamate are combined with ingredients that have ribonucleotides, the resulting taste intensity is higher than the sum of both ingredients. I'm not suggesting that there are glutamates combing with ribonucleotides in wine. Is there glutamate in wine? Ribonucleotides? I don't know, but I doubt it. There must be something else going on. But maybe there are certain molecules that combine with others to heighten whatever umami taste there might be in certain wines. For example, Sherry and Champagne both come from very chalky soils. Maybe something of this chalk combines with something that happens under flor to bring this taste. (Jura wines raised sous voile have the most umami taste too - could the yeast layer be imparting something that acts on our tongues the way glutamate acts?) And in the case of Champagne, the chalk combined with extended contact with lees? Sorry, but I am asking questions that I cannot answer. Just been thinking about this lately, that's all. And the other night I experienced something that really got my wheels spinning. I was eating dinner at Tsukushi, a great Japanese restaurant in midtown, and the chef served a small bowl of tofu and simmered daikon radish, both topped with a type of seaweed that I've never seen before. When it was still dry it looked almost like tangled olive green string, like the material one might use to make hair for a child's doll. When wet, it turned brown. There was a bit of broth at the bottom of the bowl which to me tasted like dashi that had been liberally infused with white pepper. 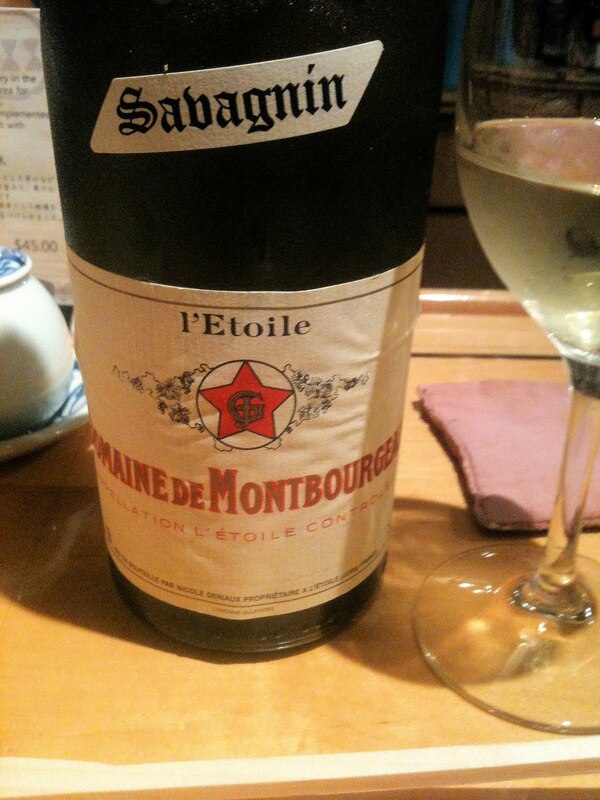 We were drinking 2005 Domaine de Montbourgeau Savagnin, $35, Imported by Neal Rosenthal Wine Merchant. On it's own the wine was fragrant with orchard fruit and very mineral, with an oxidative complexity and length - just delicious. 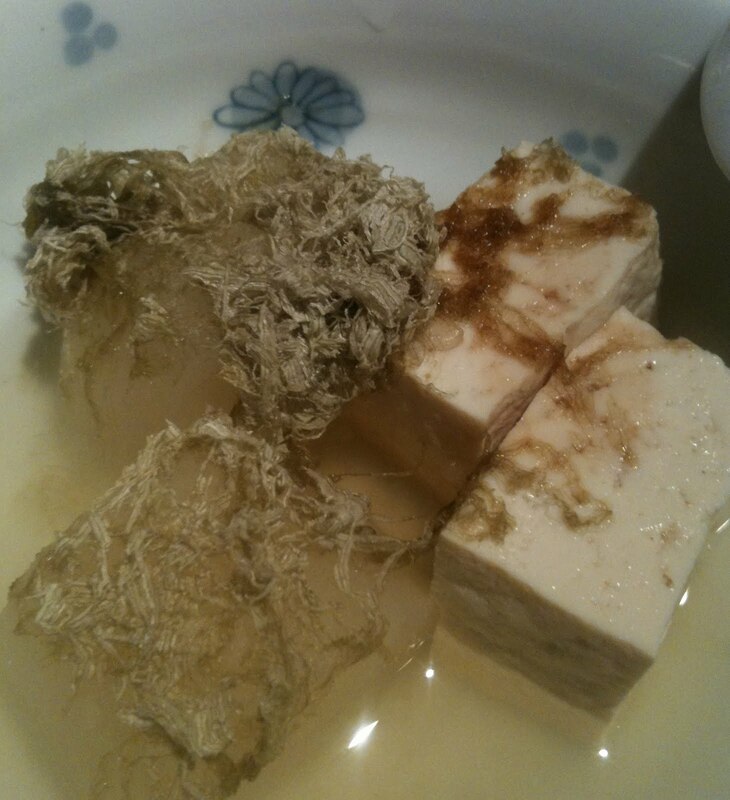 But with the tofu and daikon dish, the seaweed and the dashi broth interacted with the wine to amplify the umami character of the food and to bring the savory character of the wine to an intense level. It felt during that dish as though I had chicken broth in my glass. And yes, this was a highly pleasurable experience. If you can explain this sort of thing, I'm all ears. I definitely appreciate the science behind taste. And then there is also a part of me that simply wants to lose myself in the experience, to leave the mystery unsolved, and to drink a lot more Jura wine at Tsukushi. Equipo Navazos La Bota de Fino Nº 24, $60, Eric Solomon Selections/Imported by European Cellars. This is what we drank with the pasta and artichokes in the previous post, and it was a shockingly good pairing with the pungent dish. Deep golden in color and showing both flor character and the rich and slightly oxidative notes of a young Amontillado, the wine is beautifully harmonious and made me think of the best salted caramel. It is actually a Fino/Amontillado, a wine that is old en0ugh so that the flor has started to die and the wine is beginning to become an Amontillado. Fino/Amontillado is not allowed to be labeled as such, and so the wine is called Fino. It comes from an old solera at Bodega Perez Barquero in Montilla-Moriles, further inland than Jerez and a place where Pedro Ximenez is used to make Sherry, not Palomino. Fantastic wine and worth searching out. 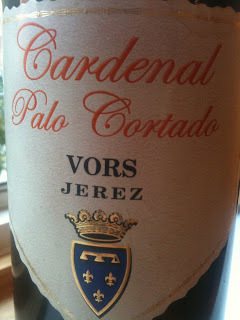 Valdespino Palo Cortado Cardenal, price unknown, not imported. Valdespino makes several special Sherries from extremely old wines, and this very fine Palo Cortado is one of them. The wines are at least 80 years old, and began life in the Inocente solera. As they aged and moved toward Amontillado they were selected out of the solera, ironically because of something that indicated to the cellar master that they would not be typical and great Valdespino Amontillado. But they are still great wines and become one of the absolutely iconic Palo Cortados in all of Sherry. Peter Liem tells me that this wine is rare and highly regarded enough that if you were to open a bottle for a Sherry lover in Spain, their eyes would bulge in anticipation. Cardenal is a 375 ml bottle and it takes time to truly open up, perhaps several days. I can tell you that on the fourth day it was majestic, and it would be silly for me to try to describe the aromas and flavors. All I can say is that it was among the most complex and fascinating Sherries that I have ever had. 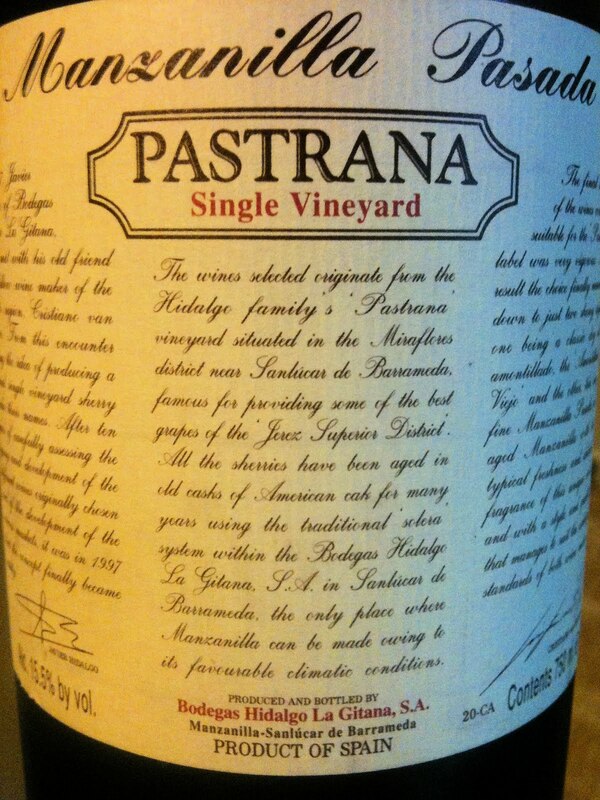 Bodegas Hidalgo Manzanilla Pasada Pastrana, $24, Imported by Classical Wines. 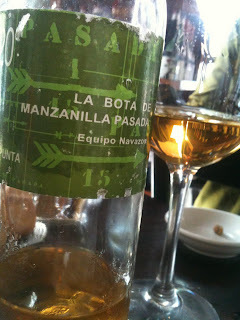 Single vineyard Manzanilla Pasada from the house that produces La Gitana. 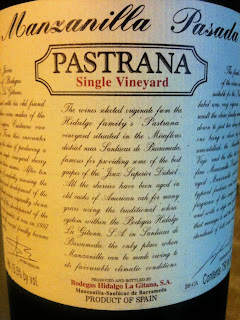 This can be very lovely wine, and this bottle was excellent, with brisk fresh flavors and prominent minerality. It is complex and pairs very well with a variety of foods, and the saline finish is very refreshing. I have experienced some bottle variation, however, and it's probably a good idea to buy when your retailer has a fresh batch. 2006 Rudi Pichler Riesling Federspiel, price unknown ($59 on a restaurant wine list). Absolutely delicious and memorable to me because of the incredible clarity with which it tasted of fresh juicy yellow plums. 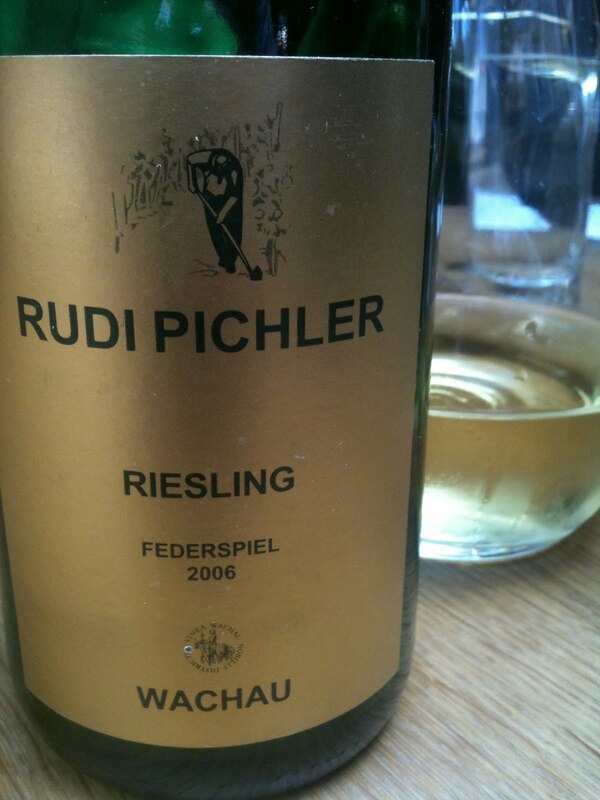 Clean and very pure, a bit waxy, very mineral, very graceful and balanced, a true pleasure to drink. And perfect with weisswurst. Why don't I have wine like this in my cellar? 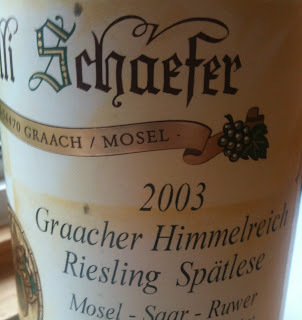 2003 Willi Schaefer Graacher Himmelreich Riesling Spätlese, price unknown, Terry Theise Selections/Imported by Michael Skurnik Wines. 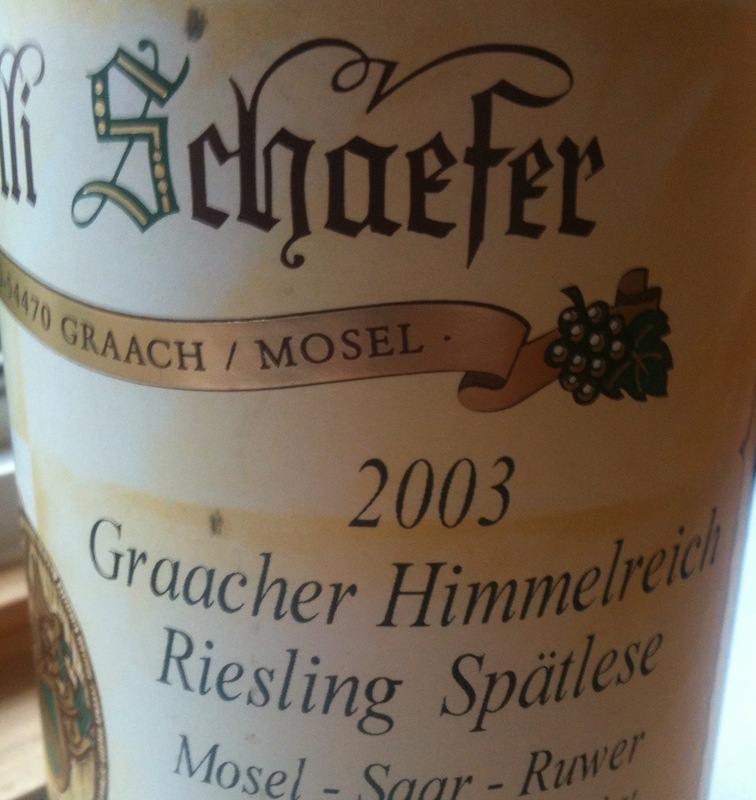 This was simply delicious wine, and as my experienced Riesling friends who shared it with me explained, in the context of the very hot 2003 vintage, this wine is remarkable. 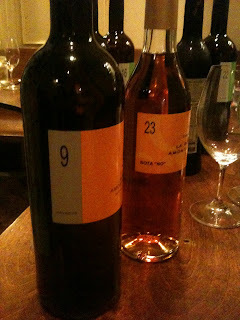 I loved the tactile sensation I got on the palate, and the very pretty floral aromas, like violets or geraniums. Intense wine, and still gentle. I'd like to taste a version of this from a more "normal" vintage. 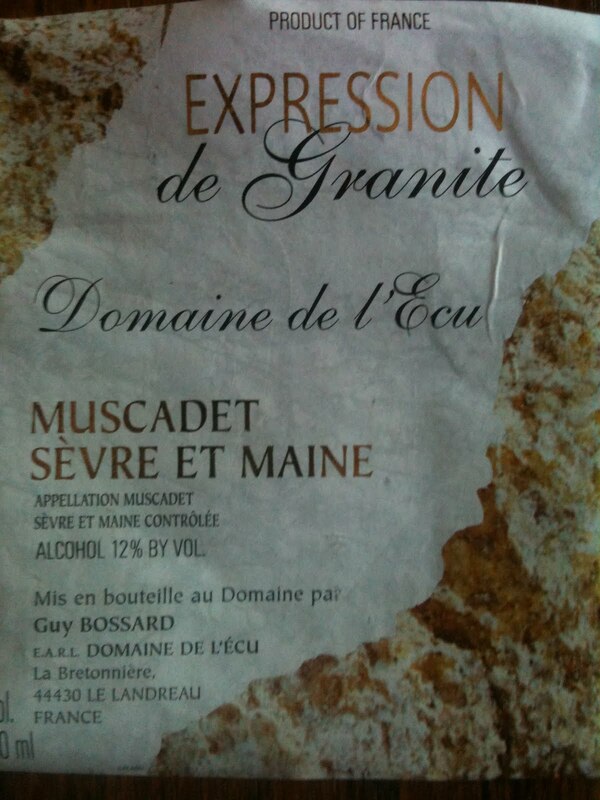 2009 Guy Bossard Muscadet Sèvre-et-Maine Expression de Granite, $18, Chartrand Imports. 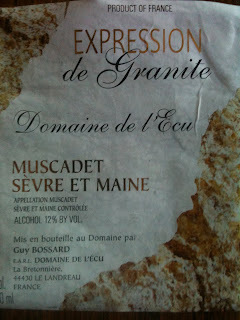 At this point, my favorite Muscadet of the 2009 vintage. This wine is just so good! A bit rich, but that's the vintage, and the wine handles it perfectly, with well defined aromas of anise seed, citrus, and stone. Great balance and already showing some complexity on the palate, the wine is very delicious and shows good acidity and a lovely lingering finish that comes back to anise seed. One of the under-appreciated wines of the world, I would say. 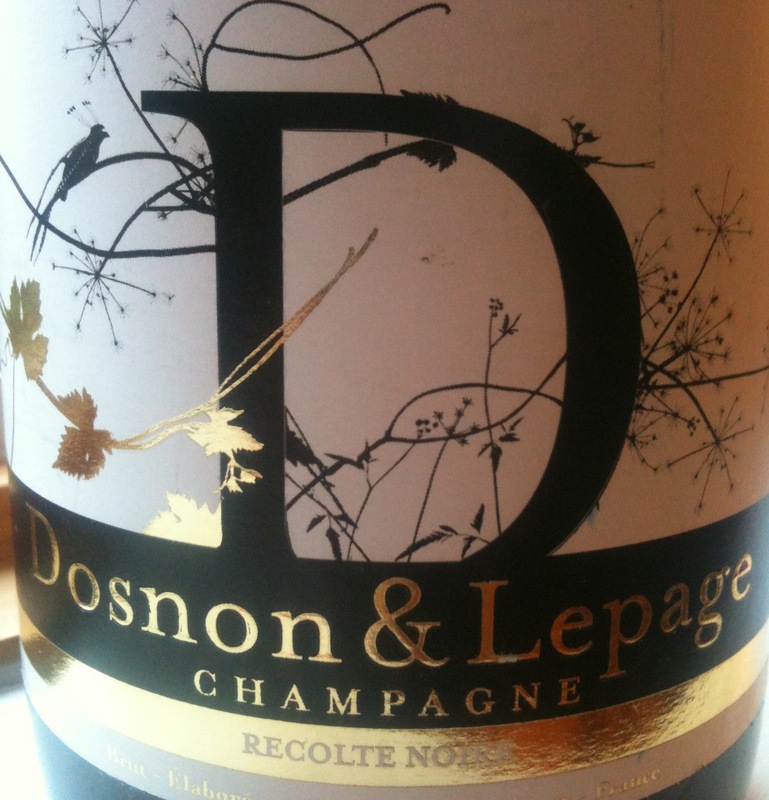 NV Dosnon & Lepage Champagne Brut Recolte Noire, about $55, JD Headrick Selections. I was shocked at how good this wine was. Not because I had low expectations, but because I thought it was pretty fantastic wine. 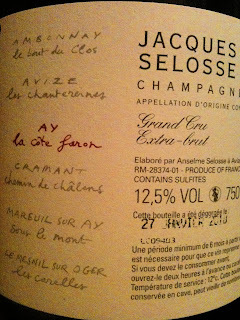 This producer and this particular wine was recently lauded by Eric Asimov in an article about the wines of the Aube. Vibrantly aromatic red fruit with earthy bass notes, great balance, very long and vivid on the finish. Absolutely delicious and I would say a terrific value in the world of Blanc de Noirs Champagne. 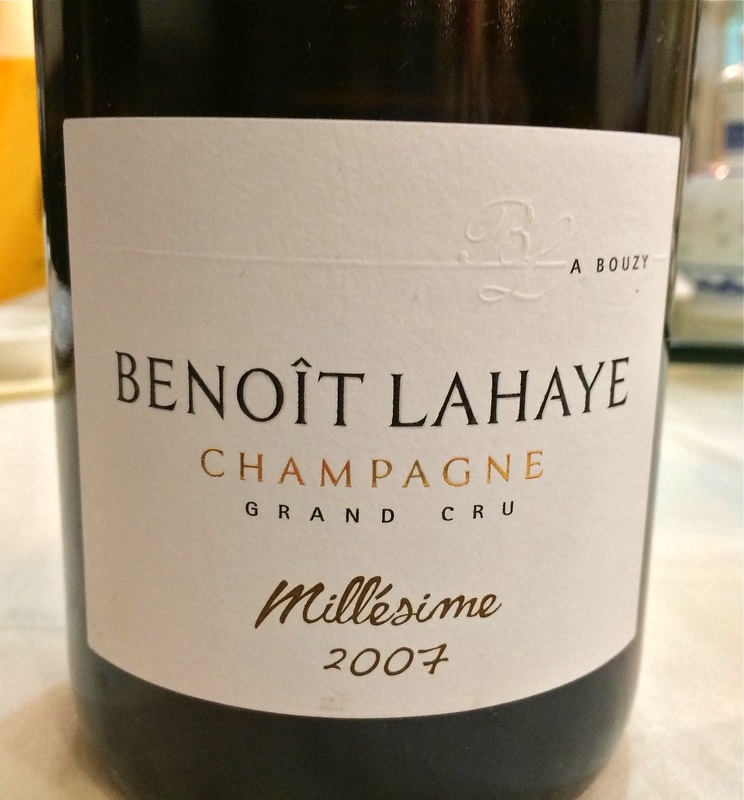 Honestly, if you like Champagne, try this wine. 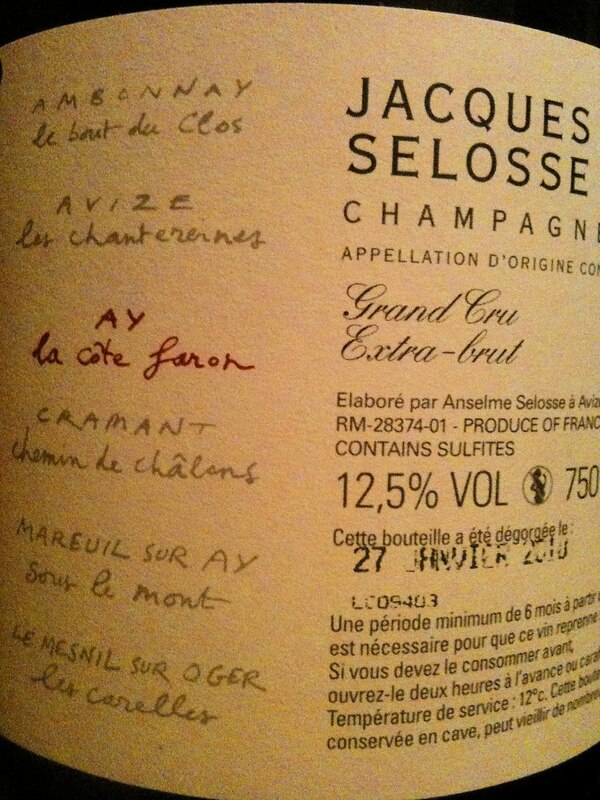 NV Jacques Selosse Aÿ La Côte Faron, price unknown, not imported (I think). Very lucky to have the opportunity to drink this wine, a single vineyard wine based on 2003 but containing 60% of wines from vintages back to 1994 from something of a mini-solera. 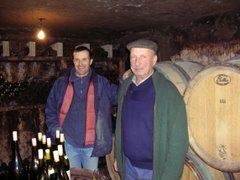 There are producers who make wine in the Selosse style, but the more experience I have with these wines, the more clearly I see that Selosse's wines cannot be imitated. A complete wine - rich and ample, brilliantly detailed, fresh and lively, oxidative and mature, deeply complex and very mineral. It feels both dry and sweetly fruited at the same time, if that makes any sense. Compelling and delicious wine. On a summer Saturday morning last year I was browsing the vegetables at Bill Maxwell's amazing stand at the farmer's market. I came to a small bin of baby artichokes. So beautiful, I thought, but how on earth to use these things? My friend Albano, who owns a restaurant called Aliseo, came over and said hello. I asked him what he likes to do with baby artichokes. "Oh it's easy," he said. "Peel off the outer leaves, trim the tops and the stems, slice them thin, and cook them in a pan with olive oil, rosemary, and mint. Put that on pasta - that's it." Sounds reasonable. I've learned since then that you must either boil the artichokes before cooking them in the pan, or cook them for quite a while in the pan - no matter how much you trim them, they are woody. 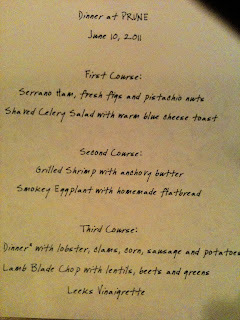 I don't mind this, in fact I like it, but if you're serving this to guests, it's something to consider. Recently I made this dish for a few pals who came to dinner. I started with a bit of garlic, an anchovy fillet, and a little bit of dried red chili flakes. Into the pan went the sliced baby artichokes, salt, and I added some chopped rosemary as the artichokes were cooking. Must say, this didn't smell all that bad. Add some chopped mint and toss right before combining the artichokes with the pasta - I used straccetti pasta this time. Maybe a longer noodle like spaghetti would be better, actually. 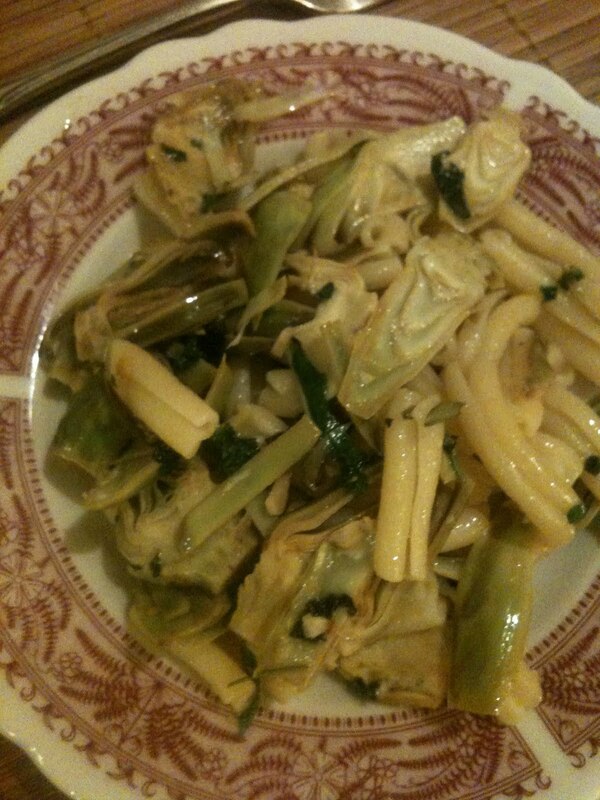 So that's it, that's the dish, streccetti pasta with baby artichokes, herbs, and olive oil. 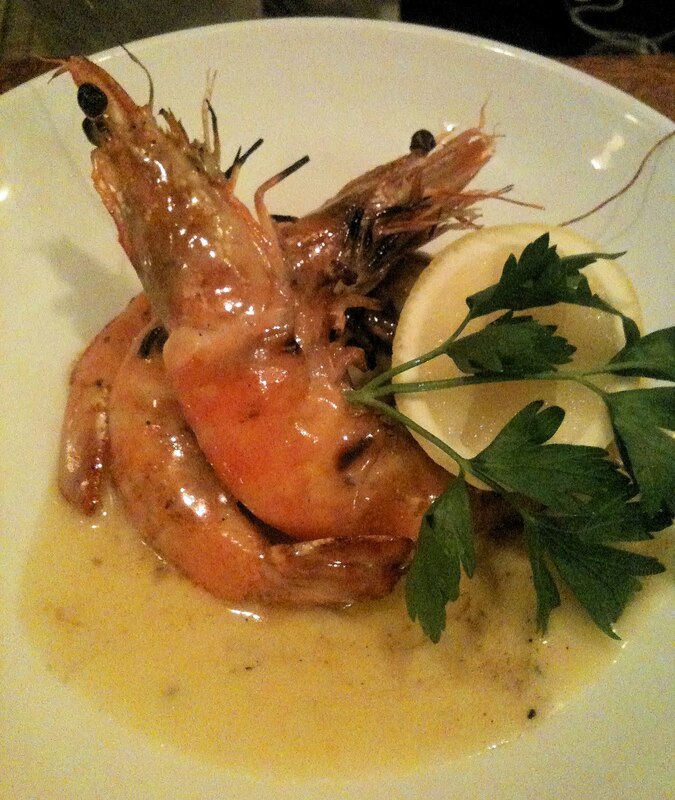 You be the sommelier - what would you serve with this dish? Leave your thoughts in the comments and soon I'll tell you what we drank, and how it worked. I drank a fair amount of Sherry in the past few weeks, a lot of it with Peter. Our Sherry conversations veered in many directions, but one thing that kept coming up is the issue of filtration. Filtration is not complicated as an idea - you pass the wine through a filter that removes the particles that are larger than the filter's holes. Wine makers filter wines so that they do not throw off a sediment later on, so that have a more clear appearance, to stabilize them for overseas shipping, and for a variety of other reasons. Filtering wine has an unfortunate side effect, however. Some of the particles that are removed are particles that would have imparted a great deal of flavor and aroma to the wine. We don't really know what we are missing when we drink filtered wines, as most of us never have the opportunity to drink that same wine out of barrel before it was filtered. We accept that wine as it is, never realizing that it might actually have been more aromatic or flavorful before the filtration. Many of us wine drinkers know about the problems of filtration, though, and we like to buy and drink unfiltered and unfined wines. 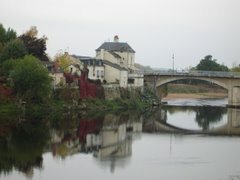 This is made easier by the work of the many importers, whose portfolios include producers who do not filter their wines. 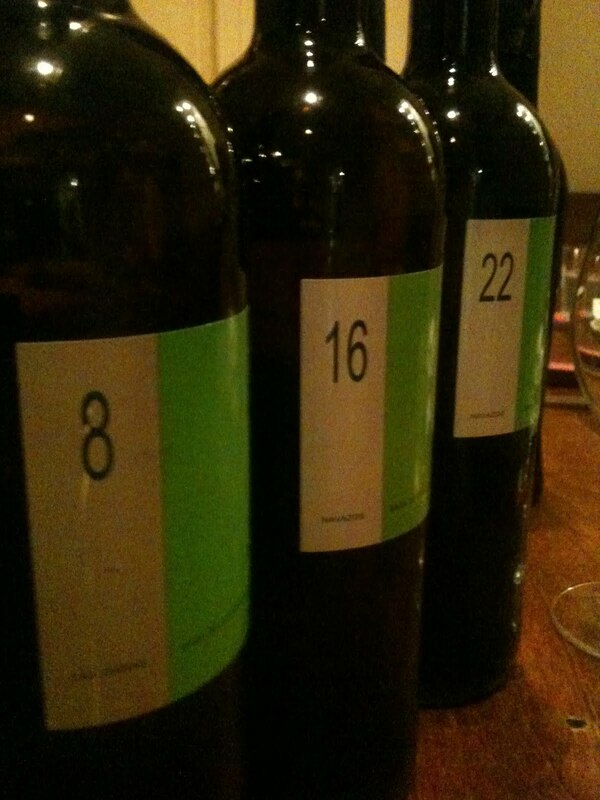 This is not so easy, however, if you are a Sherry drinker. The overwhelming majority of Sherry is heavily filtered, and it's not an importing or a shipping issue - the wines that people drink in Spain are heavily filtered too. This is not to say that filtered Sherries are not delicious, not at all. They most certainly can be, and because almost every Fino and Manzanilla has been filtered, usually quite heavily, that probably includes your or my favorite Fino. "So, what's the big deal," you might be wondering. "I mean, if my favorite Fino Sherries are heavily filtered and they are still delicious, does this matter? " I cannot claim to be anything other than a raw novice in this area, but I can already tell you, unequivocally, yes, it does matter. Peter said that Fino Sherry is golden in barrel, that the pale straw colored wine that we know as Fino Sherry is a recent thing, since the mid-'70s. We are all drinking Fino and Manzanilla Sherries that have had particles that impart aroma, flavor, color, part of their spirit filtered away. Unless you are drinking Equipo Navazos wines, that is. One of the many things that makes Equipo Navazos Sherries so special is that they are barely filtered. 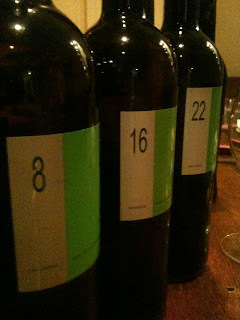 The wine on the left in the above photograph is the essentially unfiltered Equipo Navazos La Bota de Manzanilla Nº 22, $43, Eric Solomon Selections/imported by European Cellars. 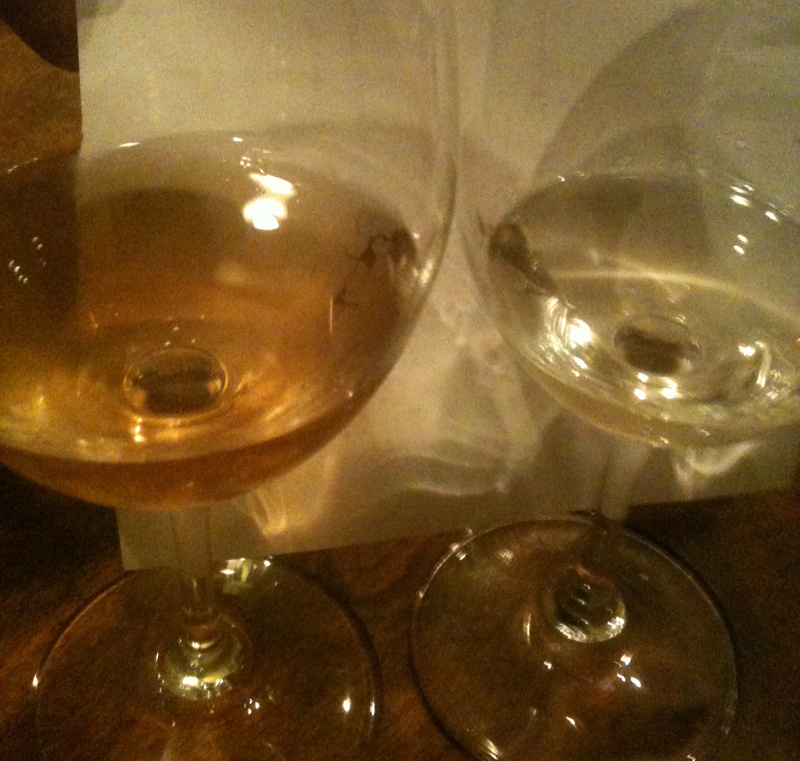 On the right is Pedro Romero Manzanilla "Aurora," $12, Frontier Wine Imports. Okay, these are not the same wines so this is not a scientific comparison. And don't get me wrong - I really like Pedro Romero Aurora and have certainly drunk my fair share over the past year. But when you look at Aurora, smell it, and taste it next to an (almost) unfiltered Manzanilla of similar age, like La Bota Nº 22, the differences are stark. The unfiltered wine has a vivid and pungent character, a vibrancy, and alive-ness that the heavily filtered wine does not. 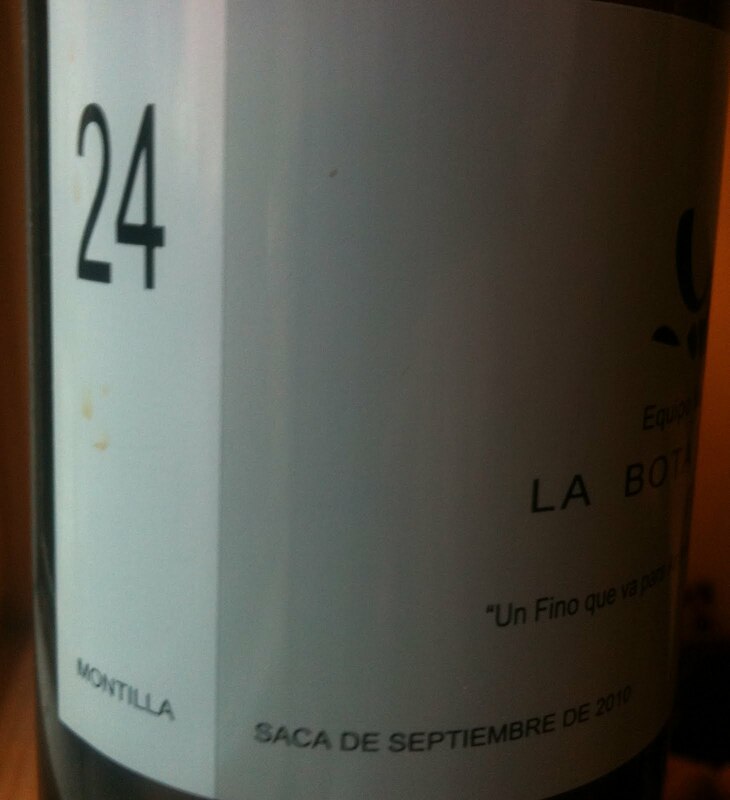 And somehow La Bota Nº 22 still comes across as the more delicate wine, too, more quietly elegant and graceful. When we drank these wines together it reminded me of what can happen to a person on heavy doses of anti-depressants. It's as though all of the different expressions of Sherry are muted or removed by the filter, leaving the wine in a somewhat numbed central state. Peter told me that the bottled version of Aurora, although very tasty, is qualitatively nowhere near Aurora when he tastes it out of barrel. So this isn't about comparing Pedro Romero to La Bota Nº 22, it's also about comparing Pedro Romero's Aurora with an unfiltered version of itself. How can we buy that wine, the unfiltered version of Aurora? We cannot, sadly. There are literally almost no unfiltered or barely filtered Fino and Manzanilla Sherries available. Perhaps the popularity of Equipo Navazos wines will help to change this, hopefully encouraging Sherry producers to bottle and sell unfiltered versions of their wines. But for now, if you want to drink unfiltered Fino and Manzanilla Sherry, you can content yourself with the La Bota wines. I recently drank this fantastic bottle of Equipo Navazos La Bota de Manzanilla Pasada Nº 20 "Bota Punta" at Casa Mono at a great lunch with friends. The wine was richly golden. It took a while to open up, but when it did it was beautifully harmonious with a nose that was both pungent and understated, deeply complex but with very well articulated individual characteristics too. When we poured the final drops, we noticed the sediment on the side of the bottle. There are terms in wine that, for me anyway, can take on meaning simply because I hear them so often. Do I really understand, though? Maybe. Perhaps I just compile shades of meaning from the many contexts in which I hear the term used to form an understanding, an understanding that might not reflect the actual importance of the idea. To truly learn something, there is no substitute for hands-on experience. Old vines is one of these wine terms, and the other night I had an experience that adds an important new layer to my understanding of why old vines are important. 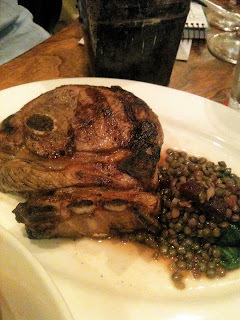 I was hanging out with my pal Dan Melia at Txikito, a Basque influenced tapas bar. We ate things like fresh peas with minted goat's milk and roasted tomato sauce, squid ribbons with pine nuts, crispy beef tongue, and fried silver fish with poached egg and arugula. 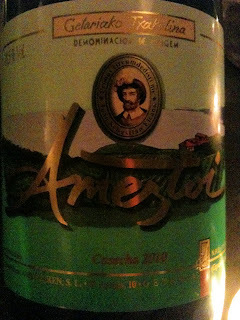 We drank a bottle of one of my favorite white wines in the world, Ameztoi Getariako Txakolina. Although still relatively obscure, you've probably drunk or at least read about Txakoli, the lightly carbonated and refreshing wine made in Basque country, near the sea. Although I have enjoyed every recent vintage of Ametoi's Txakolina, 2010, the current release, strikes me as a classic version of the wine. It's is not so much about fruit, more about minerals and sea air, a vague undercurrent of something like raw lentils. There is a sneaky intensity here too, something deep in the core of the wine. The wine is absolutely delicious and completely refreshing, and probably way too drinkable for its own good. The bartender at Txikito poured the wine in what I know now is the traditional style, in a high arc to aerate the wine, and through a little cap inserted into the bottle with two holes to control the stream. We were having such a nice time, and the wine was so good that although we finished our bottle, we decided to have another glass before leaving. 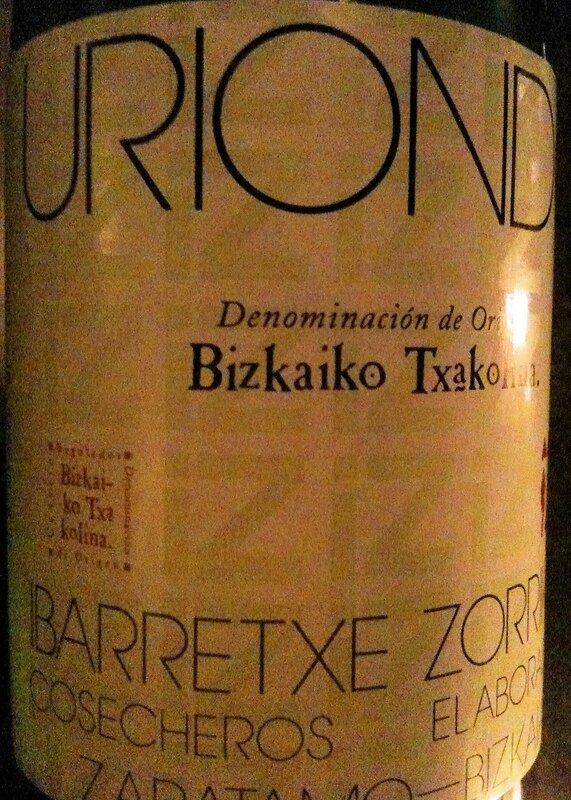 At the last minute I decided to try a different wine, the 2010 Uriondo Txakolina. 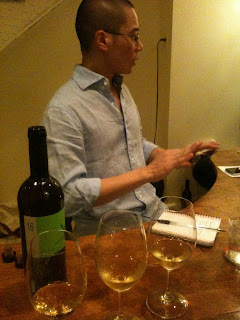 Dan stuck with Ameztoi, and comparing these wines was illuminating. Ameztoi's vines are in the Getariako appellation near the town of San Sebastian. 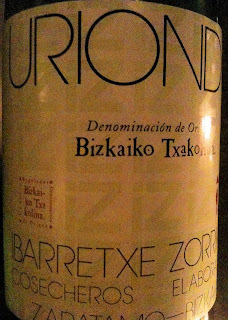 Uriondo is a newer producer whose vines are in the neighboring appellation of Bizkaiko. Both wines are imported by the intrepid André Tamers of De Maison Selections, and based on the high quality of his selections in general, I would happily try anything he brings in. There are differences in terroir here about which I am ignorant, but the differences between these wines was rather stark. The aromas and flavors of the Uriondo veered towards lemon and cream and the texture was fuller. The wine was fine, although not special, and I thought the Ameztoi towers above it in quality. We were wondering at this when Dan looked at me and said "This is the power of old vines. With really old vines you get physiological ripeness at lower potential alcohol levels, and you retain freshness and purity, you retain the essence of the wine. "This makes a lot of sense to me. Ameztoi's vines are at least 80 years old, and the wine shows a great fineness of texture and clarity of aroma and flavor. It is merely 10.5% alcohol, and wonderfully fresh. The Uriondo vines are probably much younger, although I don't know for sure. But this wine was without the fineness, the articulation of the Ameztoi, and the alcohol actually jutted out a little bit at only 11.5%. I suppose a better comparison would be Ameztoi's wine with a young vines version of the same wine, something that I doubt is produced. Still, it was an interesting experience that advanced my understanding of old vines - it's not just about taste and structure, it's also about what is physically possible in the vineyard.